I’m taking a look at 50 Fashion Designers You Should Know and exploring how they’ve used crochet in their looks. I’m also looking at some of their non-crochet runway pieces that would be amazing if re-imaged in crochet. This week, the designer is Andre Courreges. Andres Courreges is not only a fun fashion designer but one who really comes from a terrific era in fashion – the 1960’s. In 1965 he put out a “space age collection” that did two big things: showed off that classic geometric fashion and white catsuits that represents the era and debuted miniskirts that showed off the knee for the first time on the runways of France. He fell in love with fashion when he moved to Paris in his twenties where he did a decade-long apprenticeship with Balenciaga but Courreges had something of a rough go of it in the fashion world. After the 1965 show, many people were copying his work and he decided to close down his fashion house for two years. He came back after that with some other hit runway shows and great designs but by the mid-1980’s the fashion world had eaten him up and he closed down his couture line. He returned to the runway a few more times but isn’t the household name that many other fashion designers are. People who love ’60s fashion, though, know that the world wouldn’t have been the same without his vision! DressingVintage.com says that this is a 1960’s vintage Courreges piece and it certainly seems in line with what he was making at the time. Ebony Magazine from 1974 says that the caps and tops here are knit but the shorts are crochet. Maybe it’s not super wearable but I’d love to see it on the runway or in a magazine! This brown and white wool coat (via Flickr) would be so fun re-imagined in crochet! 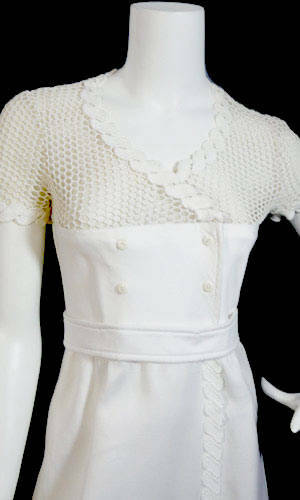 Retronaut showed off Courreges 1964 Moon Girl and I love this particular dress for a crochet comeback! I think the ruffle detail here would be easy-ish and fun to create in crochet. What are your thoughts on Andres Courreges’ designs? I’m really enjoying this series. It’s inspiring to see what these designers have done, and always good to be reminded that crochet can be supremely fashionable! Thanks so much @JR … it’s a wonderfully fun series to work on so I’m glad that y readers are also enjoying it!